I make onion skin dyed Easter eggs each spring. This tradition has gone back generations and generations in my family. 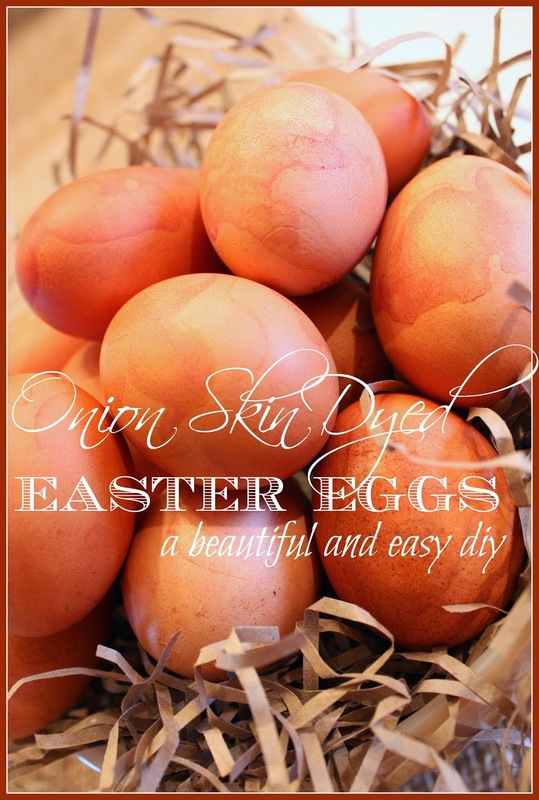 Onion skin dyed eggs so easy and even more satisfying to make. 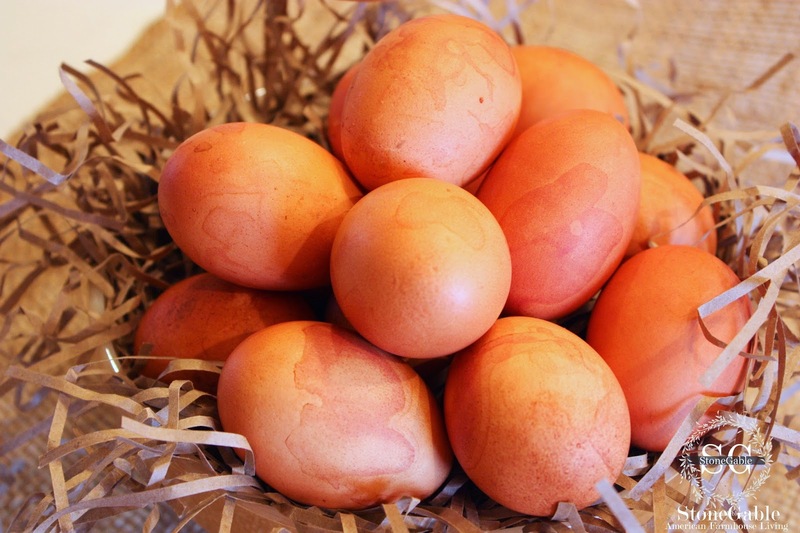 A basket of these almost magical eggs are a real treasure! Deep oranges, warm browns, soft terracotta. Not your typical Easter colors. But once you see them you will understand! Here at StoneGable, I continue an Easter tradition that spans back many generations. I have vivid memories, as a little girl, dying onion skin eggs. 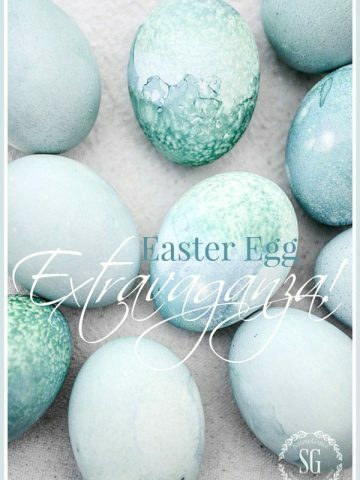 These special eggs, dyed with papery onion skin, were prized above all the pretty pastel and sherbert-colored eggs. They were tradition. My grandmother, Nani, learned from her mother. It was the way in the old country. Now my daughter and daughter-in law will carry on this family tradition! *The pappery skin from yellow onions. To dye 1 dozen I used the skin from about 3 lbs. onions. Rub or peel the outer papery skin off of onions. Put onion skins in a large pot. Add 1 dozen clean large eggs and enough water to just cover them. Gently swirl the onion skins in the water so they envelope the eggs. Put the pot on the stove and cook uncovered on medium low heat until water comes to a steady boil. Ocassionally stir onion skins around eggs. When water boils, turn off heat and put lid on pot. Let pot sit for 17 minutes. When time is up, remove eggs and onion skin to a bowl with a slotted spoon and put in the refrigerator. Arrange onion skin around eggs. This will give them a more pronounced mottled look. Eggs can sit awhile. I usually let them sit in the onion skins for about 1 hour. Remove eggs from bowl and rinse. If there is any dried onion skin on them scrape it off. I keep the onion water and let it cool. If I want a couple of darker eggs, I put eggs in the onion water in the refrigerator for an hour. Remove eggs and rinse. Discard onion skins and water. Keep refrigerated until ready to eat. I hope you enjoy this beautiful and natural way to dye eggs. 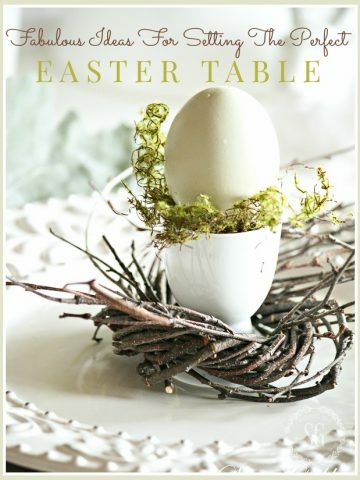 FABULOUS IDEAS FOR SETTING THE PERFECT EASTER TABLE! Hi–love these! Two things–I assume the eggs aren’t cooked when you put them in the onion skin water. Also, have you ever tried the skins of red onions? I definitely want to try this. I all ways dye my eggs with the store bought dyes. But this year no more chemical dyes. I will dye my eggs with natural colors I will do the onions and the red cabbage dye that you posted …Thank you Yvonne. Love the onion skin eggs! I did them last year and came out great!! Thank you!! I use hard boiled often in a vignette in a plain wooden bowl. Boil up 1 doz each white and brown eggs. Cheap center piece. These eggs will last forever IF you don’t crack or damage them. Later, as you shake the egg you will hear and feel the contents of the eggs rattling around inside. It actually dries up! No odor, no problem. I have also used RITE dye to color eggs, but messy. It des give some lovely colors! 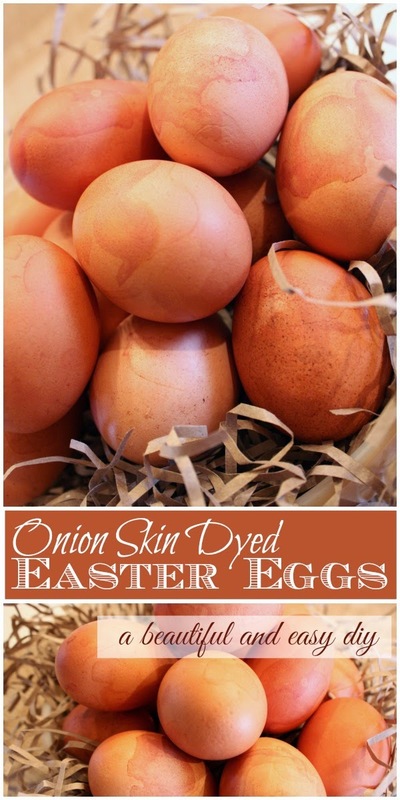 My mother always made dyed onion-skin Easter eggs. I loved the warm and rich color of those eggs. Will continue this tradition with my granddaughter. Thanks for the recipe and the memories. Hi Yvonne! I have done this for the past few years. I think this is my third. Ever since you posted it. This is one of my favorite things to do at Easter! The eggs turn out so unique and beautiful. Love the mottled look. Last year I used the yellow and purple skins. I remember that both turned out brown (to my surprise) but I believe it was the purple that were a little darker. Anyway, thank you for the wonderful DIY. It is now a tradition with several of my 6 daughters. Love your blog!! LOL! I meant…do they have to be hard boiled, or can I blow them first? Thank you! I know you posted this some time ago, but I am DYING (no pun!) to try this. I don’t believe I noticed in the directions, but can you use blown eggs for this? They are just beautiful! Hi Nancy, Just use white eggs. LOVE the pun! What a special tradition. Thank you for sharing we us. WI be trying this for Easter. What color and brand of paint is on the blue door with the Forsythia wreath? I just love that color. Linda, The short answer is I don’t know. It looks grey sometimes and blue other. It was supposed to be slate grey, but I think the color was mixed wrong at the paint store. Sorry I can’t help you any better! My german grandmother made eggs like this and she saved the onion water and have up sit it in the yard for the bunny to come back and lay her eggs. She called it ‘rabbit soup’ . These look rad! I haven’t made dyed eggs since I was a kiddie! The grandmother of a childhood friend taught me this technique, although hers involved wrapping each egg individually with onion skins and cheesecloth, but to this day it is my favorite way to color eggs. 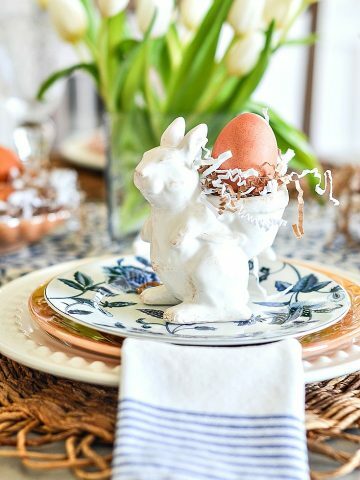 Last year I tried it on blown out eggs so I could use them year after year in some of my spring décor. I carefully wrapped the blown out eggs in dry onion skins and wrapped them in foil. They will try to float when you boil them, so I placed a small plate on top to hold them down. They turned out beautiful, but I think next year I will try your method of adding the skins to the water. Your pictures are just lovely. I knew the Native Indians used foods and fruits to dye cloth. Beets would make a lovely rose color but I had never thought of using these for eggs. I love it! WOW onion skins !! This is a great Idea thanks for sharing. Lovely! I think I may have to try these this year..I’m kind of ‘over’ messing with the usual dye kits. My ancestors came from Germany- maybe I’ll call it getting back to my roots. :). Thanks for sharing these! This is great ….. And….. Before you discard the onion water – Use it as a natural highlighter for your hair! You will get beautiful, natural golden highlights – with NO chemicals! Don’t believe me? Google it! Very interesting Yvonne! I had heard that onion skins were used to dye things. Might try dyeing with purple onion skins. Each one is different, making them unique and special. Can you also do this with red/purple onions? Beautiful, Yvonne! 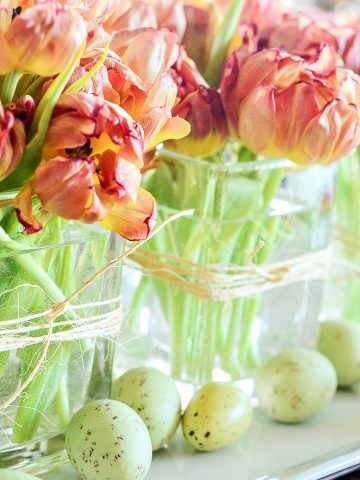 I love the natural look of these eggs and the fact that it is a tradition in your family that has gone from generation to generation. Thank for stopping by this week to leave a sweet comment on my Buttermilk Mini Muffins. I hope you have a wonderful week. My grandmother was an immigrant from Russia. I have vivid memories of Easter eggs of this color at her home. My mother never carried on the onion skin tradition, but I think I may start up the tradition again, and use onion skins this year with my 3 year old and one year old grand daughters. Thank you! That’s so neat! I love the variations of color that it gives.. beautiful! I love the mottled look. Onion skin is lovely to die lots of things. So naturally beautiful. What a great idea. On my “To Do ” list now. I just love how those turned out. I just may try this plus some other natural colors. This is something we do in our family too! Sometimes I use red onions for a wonderful purple. Although my favourite is the subtle colou from yellow onions.